Please note that these guidelines exist to create a standard for all SLA parts. Deviations outside of these guidelines are acceptable as long as they are discussed and agreed upon with your customer. 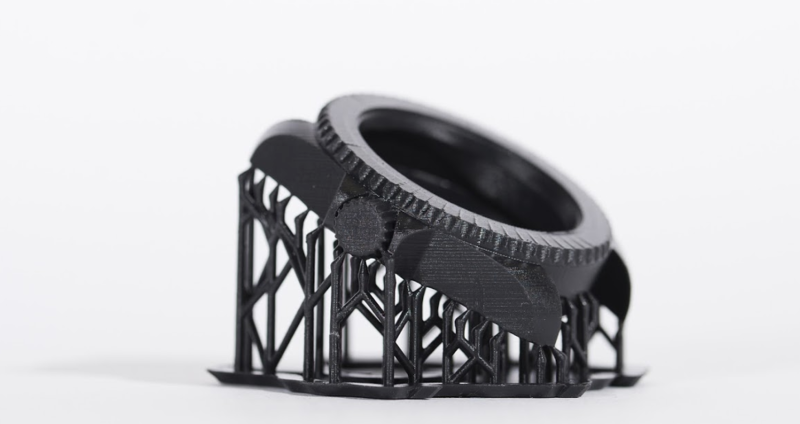 In the past one of the biggest discrepancies that used to occur with SLA prints on the 3D Hubs platform is the variations in price that were presented to the customer on the 3D Print Page. Some Hubs have the cost of support and support removal included in their initial price while others only present the cost of the the printed part (not including support) This results in a marketplace where customers could be misinformed about the actual price of their print. When preparing to print, always make sure to keep the use-case of the customer in mind. Often customers will have a “presentation” side of a model where the location of support (and the negative impact it has on surface finish) is undesirable. Make sure to check the description of the order to see how the customer intends to use the part and whether the location of support will have a detrimental effect on the final model. Correct support replacement can also greatly reduce the need for post-processing steps. Example 1: if you receive 3D models of character figurines you want to make sure that the support structure does not get applied to any of focus areas (the face for example). Example 2: With functional tubes, try to avoid supports being generated inside the tubes. Example 3: Having a smooth internal surface on this print is critical to how it will function. Because of this, the part has been printed with all support located on the bottom surface. SLA/DLP parts need to be produced within an accuracy of ±0.15 mm or 0.5% depending on which is greater. Example: in the case of a 40 mm cube, a 0.5% accuracy requirement would result in a max of 0.2 mm deviation. As this is above 0.15 mm, the 0.2 mm is leading and determines the maximum. A printed part of 40.2 x 39.9 x 39.9 mm would be acceptable as the deviations are within this 0.2 mm. Printing a cube that is 38.8 x 39.4 x 39.4 mm would not pass the dimensional accuracy requirements as the width deviates more than 0.2 mm. Make sure that you UV cure the parts of the order thoroughly. Uncured (sticky) prints should not be sent out to the customer. If your customer has a tight deadline, make sure to inform them of the time required to properly post-process the parts. So they can make an informed decision on whether or not they would like to continue with the order. Formlabs offer an excellent guide on UV post-curing that can be applied to most resins, feel free to check it out right here . The level of support removal & post-processing should always be discussed between the Hub and customer as it has a great impact on the amount of time it takes to complete an order. If this is not explicitly discussed, we expect Hubs to deliver all parts to the level of sanded support nibs as described in the Post processing for SLA post in the 3D Hubs knowledge base. 3D Hubs will ask customer to describe the level of finish they require on their print before the order is sent in. SLA parts can be brittle depending on the resin, because of this, parts must be packaged securely to ensure the print is not damaged in transit ( a regular occurrence in SLA orders). Please be aware that Hubs are responsible for packing and shipping and if an order arrives broken the customer is entitled to either a reprint or refund. These guidelines apply to all SLA orders on 3D Hubs and can only be deviated from when specifically discussed and agreed upon between Hub and Customer in the comments section on the order page. If a customer raises an issue, prints are reviewed against these quality guidelines. If the print doesn't meet the guidelines and have deviations were not discussed within the comments on the order page the customer has the right to be refunded under the 3D Hubs Buyer's Protection.